The Maribor Uprisings: A Live Participatory Film is a documentary that subverts the viewing experience. 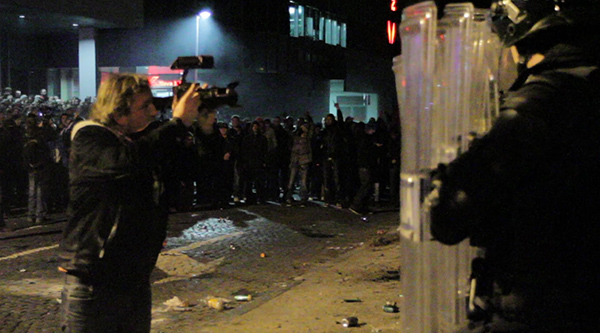 Pulling from footage of the 2012 demonstrations in Maribor, Slovenia against corruption in the government, the film places you in the streets with a first-person look at the action. Filmmakers Milton Guillén and Maple John Razsa have compiled and structured a plethora of activist-shot footage at several demonstrations that vary in intensity, and you as a viewer are meant to decide along with the people around you where to go and what to do. You can stay in the streets and mill around interviewing some peaceful protestors about their concerns and their goals, or maybe follow a more rowdy group toward City Hall and light some things ablaze. It all depends on the decisions and mentality of the audience as a whole. Using organizational tactics such as the ones implemented during the Occupy Wall Street protests—the human microphone, call and response, etc—the audience works together to form a unit of politically and ideologically motivated action. The film remains a compelling piece of documentary storytelling even without the added experience of participation. The footage is an electric display of risk-taking—the cameras get up close to their subjects—protestors and riot police alike—to stunning effect. In an age where protest footage is livestreamed and instant on social media, the filmmakers have managed to take footage of demonstrations from 2012 and make it feel as if you are experiencing it in the actuality of the current moment. You march with Maribor. You run from the riot police. You practically feel the blows of their batons. The stories of protestors present themselves to you throughout the film—you are transported to a more peaceful, quiet Maribor of the daytime, getting snippets of intimate and powerful interviews with several people. Guillén and Razsa have created an important piece of documentary filmmaking—one that manages to be informative, evocative and always engaging. 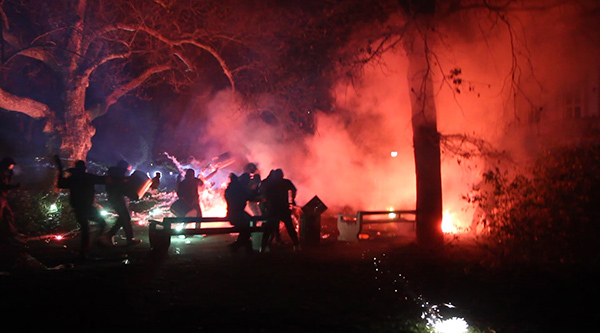 The Maribor Uprisings: A Live Participatory Film will be screened for free at Metrotech Commons on Friday June 16th. More information can be found here.